Within a few years of arriving in Melbourne in 1849, John Maloney, an illiterate Irish labourer, had bought a small weatherboard cottage in the fast-growing city. He and his siblings decorated it with Staffordshire china, dined on chicken and beef, and fastened their clothes with carved bone buttons. … it illustrates the synergy that has arisen between academic archaeologists, commercial specialists, heritage agencies and developers. The story of the Maloneys—and their neighbours in the bustling working-class area known as ‘Little Lon’ (bordering Little Lonsdale Street)—has been pieced together from excavations in the Melbourne CBD. It forms a centrepiece of a permanent exhibition, The Melbourne Story, at the Museum of Victoria. As with most urban archaeological digs, the work in 2002 was funded by a developer, in this case the Industry Super­annuation Property Trust. 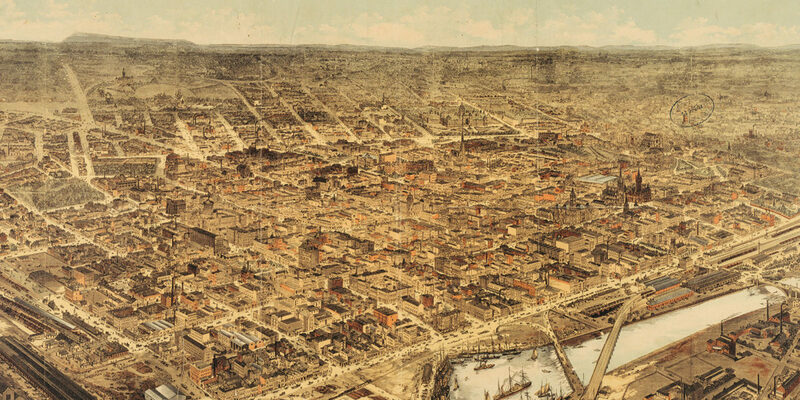 Coordinated by consultants in conjunction with a team from La Trobe University, it unearthed a wealth of material offering new insights into daily life in mid-19th century Melbourne and the city’s evolution. The half-million or so artefacts analysed by the La Trobe team, headed by Professor Tim Murray, a historical archaeologist, included coins, ink wells, miniature tea sets, lice combs, clay pipes and diaphragm-style female contraceptives. Little Lon was just one portion of a long-term project by Murray and colleagues exploring the 19th century city in Australia, Europe and North America. But it illustrates the synergy that has arisen between academic archaeologists, commercial specialists, heritage agencies and developers. Developers are required to engage archaeological consultants to investigate and document sensitive sites. That means cultural heritage is big business. And consultancy firms collaborate closely with academics, who without funding from industry would never get the chance to work on digs as extensive as Little Lon. Here, over the years, almost an entire city block has been turned over, yielding the world’s largest 19th century urban archaeological collection. Tourism also benefits, since academic analysis adds to the sum of knowledge about historical buildings such as Sydney’s First Government House and Hyde Park Barracks. The excavations at Little Lon, where the narrow, crowded laneways once housed shops, pubs and brothels, were a tourist attraction in themselves. Thousands of people took tours, watched from the viewing platform or even volunteered—all testament, Murray believes, to Australians’ increasing fascination with their history and heritage. Artefacts and photographs are displayed in the lobby of the office towers built on the site. More recently, Murray has worked on archaeological items from Sydney’s Rocks area, where the remains of buildings dating back to 1795 have been uncovered. The dig itself was incorporated into the design of a YHA hostel constructed on pillars above it. Visitors can stroll through two recreated historic laneways. By linking artefacts to documentary records, such as rate books and newspaper clippings, the La Trobe team has also challenged perceptions of the Rocks and Little Lon as slums. While both attracted thieves, prostitutes and sly-groggers, their populations were socially and ethnically diverse. “What’s exciting is that although a lot has been written about the history of Sydney and Melbourne, there’s still an enormous amount more to be done,” says Murray.